In my last post I mentioned the fun I have had the past 50 years with computers and looking back on this effort to donate & ship computers to the Soviet Union in 1991 is one of those fun times. The timing was really good as this would have been a whole different story about 8 months later with the shift in power from Soviet President Mikhail Gorbachev to Boris Yeltsin .This shift in power was the break up of the Soviet Union into 12 independent countries and the downfall of the communist system. 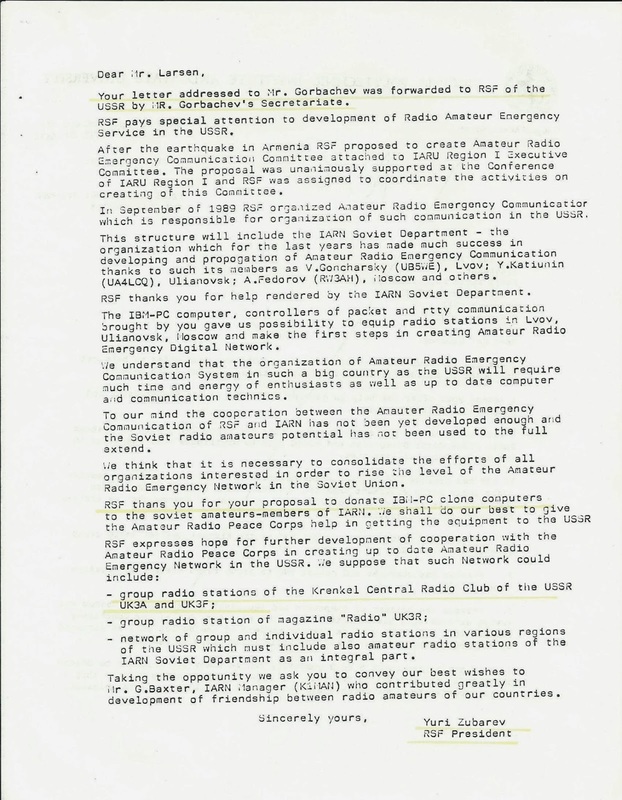 It all started with our first visit (October 1990) to the Soviet Union with an invitation from Victor Goncharsky ( An amateur radio operator UR5WE in Lviv, Ukraine) to help bring the average citizen into the computer world. Up until about that time Soviet citizens were not allowed to have a computer in their home or personal possession. This first visit resulted in taking one computer and teaching material for a training workshop. 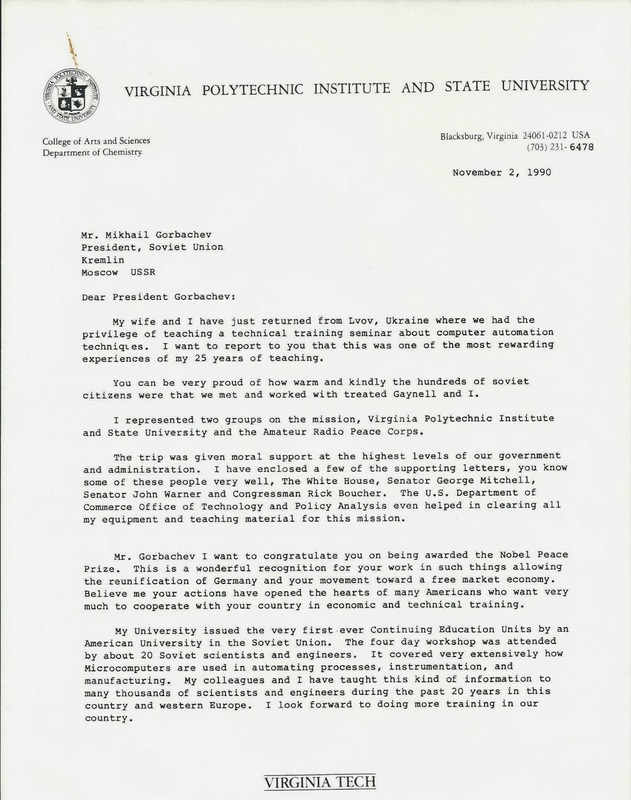 I was a tenured faculty member at Virginia Polytechnic Institute (VT) and made arrangements to issue Continuing Education Units (CEU's) for the 4 day microcomputer instrumentation workshop. The process of getting approval to do this work and carry the computer required the approval of many agencies and groups. President George W. Bush and the USA State Department were some of the groups helping with these efforts. We did make this work and my wife and I in October 1991 made our way to Lviv, Ukraine via Moscow and a 24 hour train ride with our computer and all the teaching material. It is believed this was the first time an American University awarded CEU's in the Soviet Union. This first trip was a success and we realized the great need to get computers to some of the citizens of the Soviet Countries. This and the next 15 visits were a real fascination for me, my wife Gaynell and our colleagues. Always intriguing, a bit risky and filled with stories of KGB, an acquaintance being killed, and others being sent to jail. 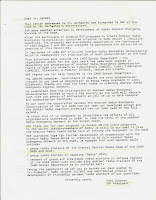 We were working with permission at the highest level of the Politburo and our government for these efforts to succeed. Why am I writing and sharing this information ? I would like to show that it is possible for average folks like me to have some really great experiences. Be careful what you ask for you may get more then you wanted. You can work at the highest levels if you have a good message - these adventures were helped along by President George W. Bush, USA State Department, Soviet President Gorbachev, many members of congress, various ambassadors and many other folks. I have saved all these correspondences - What a ride looking back over these - 100's of letters and papers. Once I made a couple of Soviet visits, officials at VT were on board with this and even gave me some special funds to carry on this work. I encourage you to get out of the box and try some new adventures - I do not suggest however taking unwise risks to you own safety. Show your skeptics you are not a pipe dreamer but a real doer. They will of course be envious when you do succeed. They say you can't live in the past - That is true but it sure is nice to look back on fun and successful events from your past and wonder --- How did I do that ? it was just great! Actually I did have opposition at my university (VT) by some folks who did not like my time away and the fact I was not just grinding away in my office. 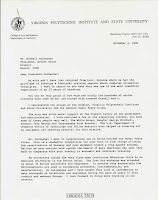 I did not have resistance from officials at VT that had power to stop this work - it was good I had tenure - The Virginia Tech President at the time Dr. Jim McCommas was a great fan of this work and helped with funding and in many other ways. Dr. McCommas sent Virginia Tech Documentary film producer "Jerry Scheeler" on one of our trips. Here is his film "Click" . Most of the opposition came from faculty members who were envious, jealous and just too lazy to get out of the box. I did this long term project because it was interesting, useful for me, the University and our whole country. 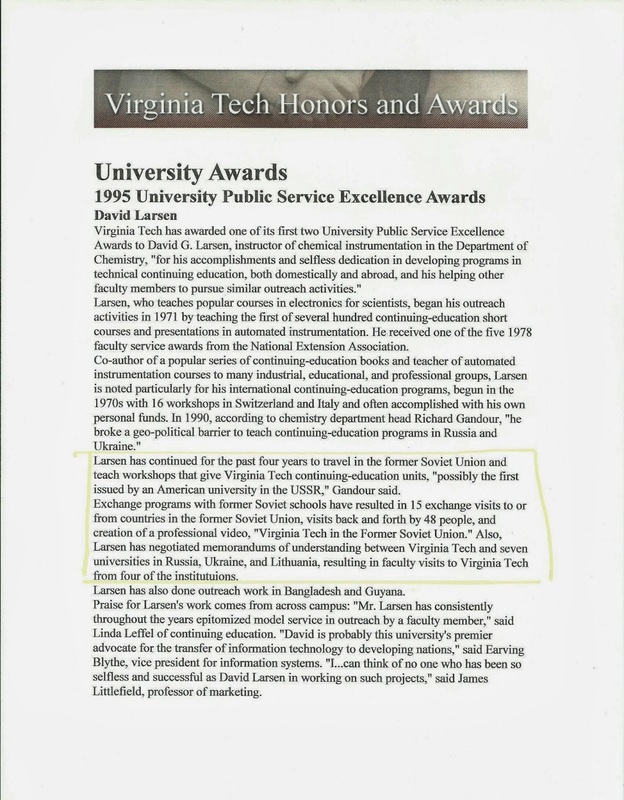 I was rewarded for this work near the end of my 31 years of teaching at VT with a University Presidential Award (1995) University Public Service Excellence Awards. This was the first time this outreach award had been presented by VT.
A great bonus- My wife and I received amateur radio licenses in Russia, Ukraine, Lithuania, and Poland . It was great fun and my wife Gaynell was the first American woman to receive an amateur radio license in some of these countries. Of course operating from there was fun - my Ukrainian call is UR5WUS and Russian call is UA4LWW. A story about our first donation of computers to the USSR appeared in the American Radio Relay League journal QST September 1991. Enlarge the photo's by clicking on them and then even more by a right click and select "View image' you can easily read the letters. 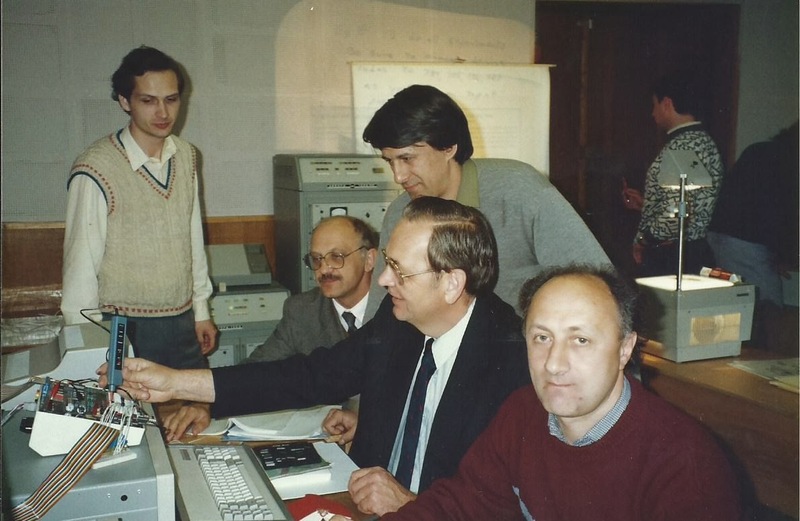 Here we are in Lviv, Ukraine October 1990 teaching our first Soviet Instrumentation Workshop. Great experience. I had brought several suitcases full of hardware to interface the computers with external devices - The folks that organized the workshop had made arrangements to have 10 IBM compatible PC computers in the class. They worked just fine and the DOS software worked good also. - the computers were good Soviet pirated IBM clones. We did about 10 workshops during the early 90's in the Soviet Union and later known as the independent countries of the Former Soviet Union. The first workshop I taught (October 1990) in Lviv, Ukraine was well attended by engineers, IT computer folks and 3 KGB agents. 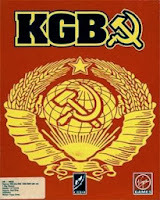 We of course did not know much about the KGB agents however they were not transparent in the workshop. The very first morning 3 attended, paying close attention to what I was teaching and talking about. I had been warned by my friends to never mention anything about the political system, religion or ask any question that could possibly suggest I was interested in their technology. One of the KGB agents was present for the entire workshop. I would not have known much about this KGB activity however local friends that were able to detect the KGB and know how they operate kept me informed on a regular basis. That was just fine I was able to just teach about computers and their use in instrumentation. Our hotel rooms and suit cases were picked thought everyday. We had no real privacy in our hotel rooms or on the street with our Soviet friends. Everyday our room was a general mess as the KGB looked at everything we had brought with us. Sometimes we would arrange our clothes in the suitcase a certain way and lay a thread or two in the suit case. It was obvious the suitcases were never repacked as we had left them. Even when we were in the hotel room our friends told us be careful what we say as the room was sure to be bugged. Actually in thinking back about it I am not surprised at all the attention the KGB gave us. We were told we were most most likely the first Americans in Lviv while it was dominated by the Soviets and most certainly the first to ever teach there. This part of the Ukraine had been under the Soviet system 53 years at the time we were doing our teaching. Lviv is a rather large city of 700,000 + people and it has beautiful buildings built by the Austrians during the Austrian Empire of the 1800's. Being some of the first Americans we were greeted by the authorities as being possible American Secret Agents. Golly could that have been true ? -anyway we did a good job and were never accused of any clandestine activities. After this first course we made plans provide a donation of computers to some of the Soviet engineers and technicians. Shipping the computers seemed impossible until I wrote to Soviet President Gorbachev. Our group gathered up several dozen computers for our first attempt to ship computers to the soviet union. 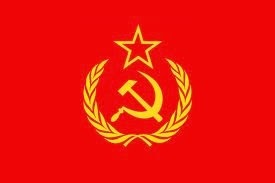 We could not find any channel or method to ship from the States to the Soviet Union. It seemed a lot of doors were just closed. 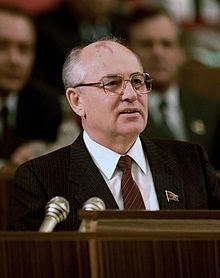 Looking for help in November of 1991 I wrote a letter to then Soviet President Gorbachev. The first response to the letter was a call from my friend in the Ukraine telling me he heard there was a letter from me circulating around the Kremlin. My friend also told me he had been ask to come to Moscow for talks with officials. My response to him was --- did they give you return a ticket? He did have the return so it looked good so far. Actually his interrogation was mostly verifying that I really did come and just teach about computer instrumentation and nothing else. I am sure they already were well aware of this because we had been constantly monitored by KGB agents. Enlarge the letters by clicking on them and then even more by a right click and select "View image' you can easily read the letters. 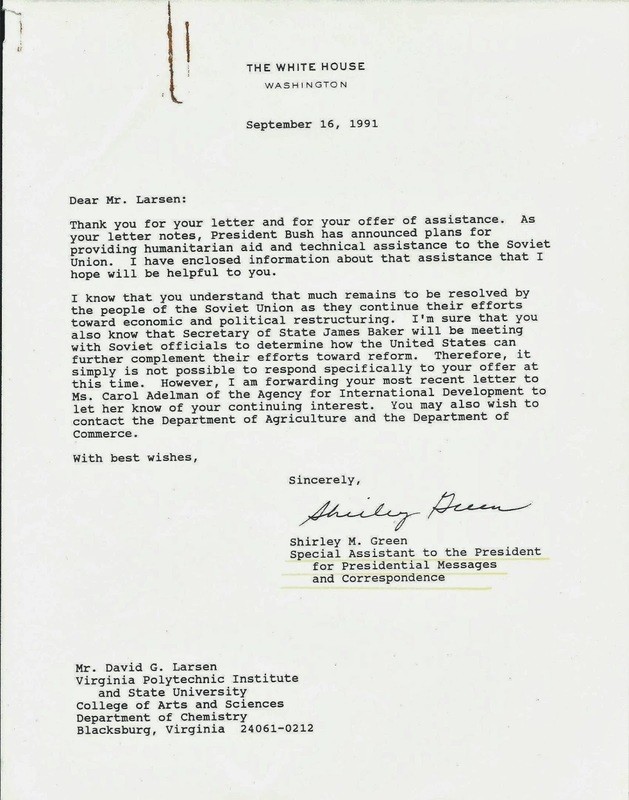 Here is the letter to Soviet President Gorbachev. 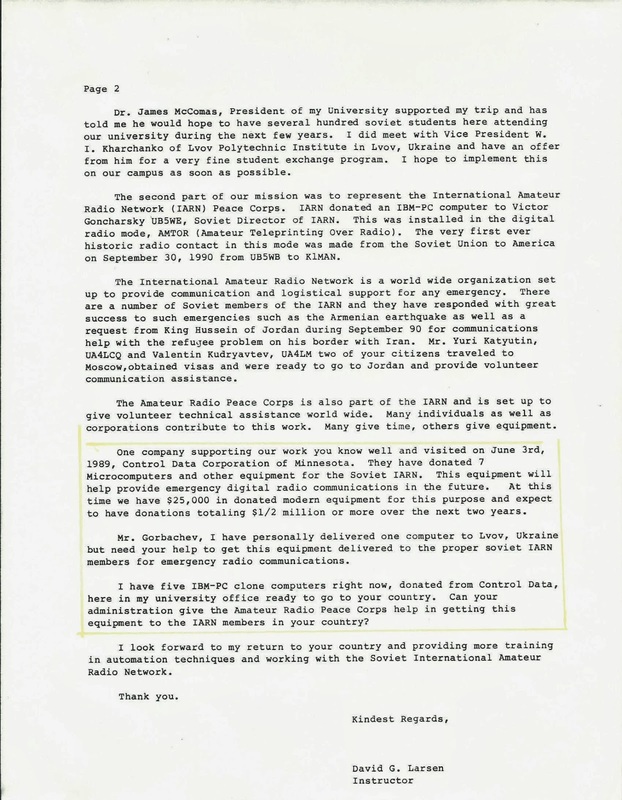 This letter was circulated in the Soviet Politburo and was passed down to Krenkel Central Radio with instructions to help get these computers into the Soviet Union. It still turned into a lot of red tape - it was a few more correspondences before the the Soviet airline Aeroflot was willing to ship them from New York to Moscow. The first line of this letter indicates reply to my letter to President Gorbachev. "Your letter addressed to Mr. Gorbachev was forwarded to the RSF of the USSR by Mr. Gorbachev's Secretariate"
to monitor 100 % of amateur radio activity during soviet times. This disappeared the day the USSR collapsed. 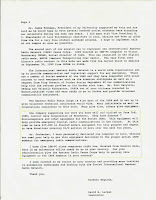 Click on letter to enlarge . President George W. Bush at the White House was a big help during our 15 training and computer donation missions to the USSR. I have a whole file box full of correspondence from officials of our government assisting with these early visits to the USSR and the newly independent countries. It was a very strong and important desire for the USA to have improved relationships with the old and new Soviet Countries. 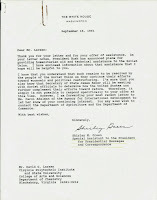 Our "Foundation for International Radio Service" was invited to a meeting at the White House in 1992. This was very interesting for me. The meeting was organized by the US Department of State and the function was - How can we best help these new independent former Soviet Countries. About 100 or more were involved in this meeting. President George W. Bush was making about one billion US dollars available at that time. Our FAIRS foundation received a monitary grant to help carry on our work in these countries. This grant is one of the very few grants made by the US Agency for International Development to an Amateur Radio organization. 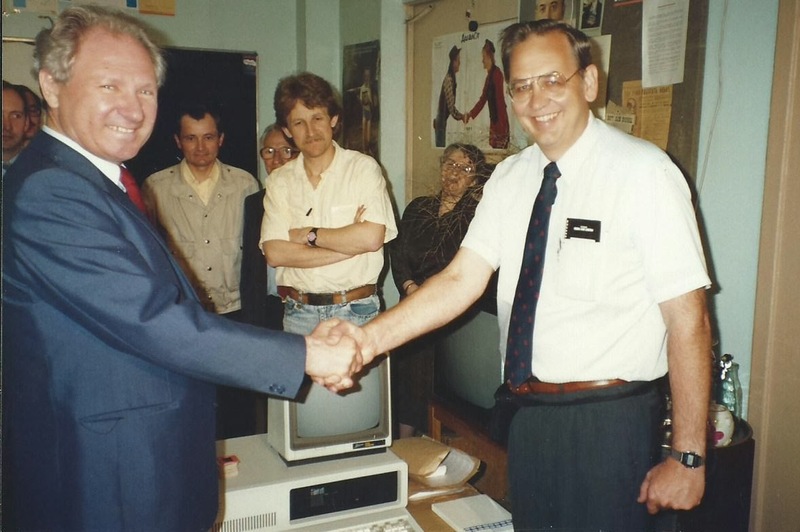 David Larsen on the right presenting one of the computer donations to the RSF or Krenkel Central Radio Club president Vasiliy Bondarinko UV3BW in Moscow. Our group was one of the last from the USA to visit the RSF in Moscow as it was only several months after this meeting the USSR became 12 independent countries and Boris Yeltsin was president of Russia. Our group made many donations of computers to Soviet Universities. 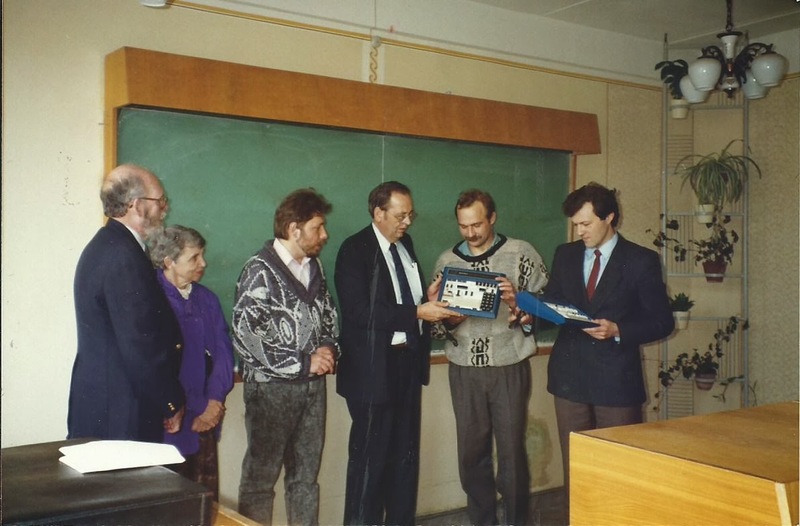 Here were are presenting computers to professor's at Lviv Polytechnic Institute in Lviv, Ukraine. These early visits to the USSR were the motivation for our group to set up the "Foundation for Amateur International Radio Service" FAIRS. The FAIRS mission statement is international goodwill though amateur radio. FAIRS offices are located in Floyd, Va. In 1995 I received the university outreach award for the missions projects and work in the the former Soviet and other countries. 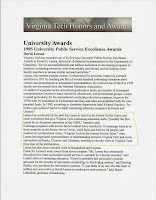 This was the first outreach award made by Virginia Tech. 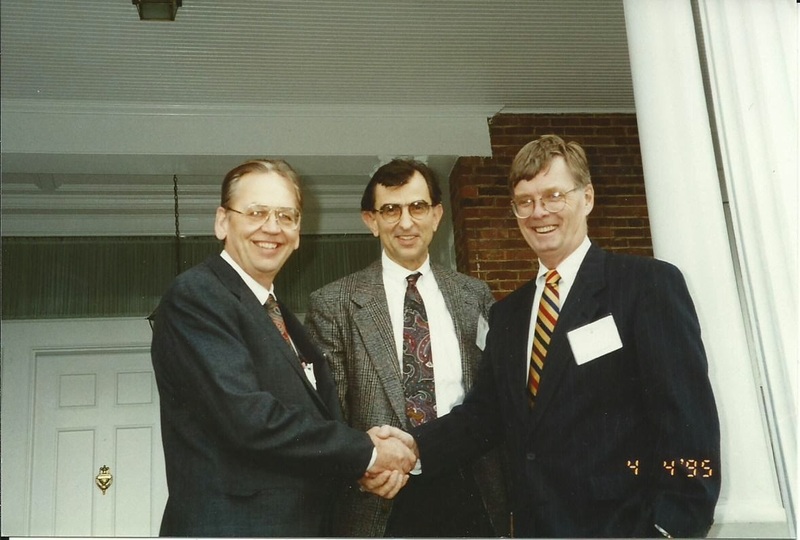 Photo L-R Me David Larsen : Dr. Richard Gandor, my department head : Dr. Ted Torgenson, President of Virginia Tech. News: Just in - a new president for Virginia Tech. WOW - Dr. Timothy Sands has just been named the 16th president of Virginia Tech. One of his goals and biggest opportunity he sees for VT is "engaging with the rest of the world" and with new ways to "bring the world to Virginia Tech". This information from the Roanoke Times 12/7/13. His comments seem to be in line with my comments eighteen years ago in 1995 as stated in my University Public Service Excellence Award. See the award "Click"
1995 - "I think it's important that universities do some outreach globally," Larsen said, "because we're now not an isolated nation because of such things as the Information Super Highway. Events that happen around the world affect us and we can influence those events by sharing our educational ideas and ideas in research around the world. It's important because events in virtually every country come back to affect our university and country." This is a long blog and it was hard for me to write because their are so many interesting stories associated with these mission visits to the USSR and former Soviet Countries. Most with great and positive endings. I will write about more of these in the future. Thank you for visiting my blog post. I'm so glad you were able to capture all of these wonderful experiences into this post! Not only does it show how your interests and hobbies can lead you in some very interesting directions, but it also gives insight into a very important part of history that so many Americans know so little about. Thanks for posting a link to the video that you made during your trip as it was very informative! Keep up the great work! Hi Johan - Thank you for the nice comment. This trip years ago was really great and looking back on it now it was fantastic. My wife and I had many wonderful adventures and many included computers.